Tri-City Psychology Services » Health News » There is no magic bullet cure for stroke. Following my stroke just over a year ago, at first I was very much in denial about how this disability was going to affect me– I was, going to be 100% recovered, and yes, I was still going on the trip to Europe that was already scheduled for October 2016 with my husband Owen, and friends. During the months post stroke all the hard work of rehab physio saw me making steady gains, then around 6 -7 months things slowly started to plateau. Owen and I had many a discussion around my ability to walk (without canes) a distance, amongst hoards of tourists … even as late as two weeks prior to leaving he was still questioning how we could possibly go? This just made me even more determined, and sure enough we took the trip… (I also took my walking poles). 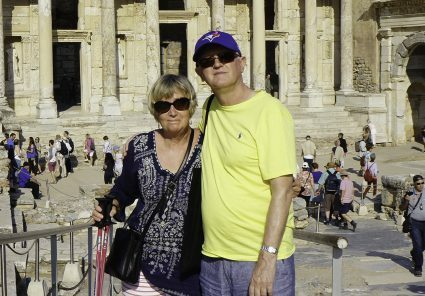 Many a day we racked up over 10,000 steps sightseeing the wonders of ancient Greece and Turkey. Despite hoards of selfie taking tourists at the Acropolis, I survived to tell the tale. The sunshine worked magic, and all the extra walking was good therapy. Good weather, good food, great company…. it really it was the best therapy. How has my life changed in this past year? Well would you believe I’m no longer skipping to the gym at 6am….ha ha. I am super slow getting up in the morning. Getting dressed takes much longer, putting on socks and pants present quite the challenge, I’ve learned to be creative with how I fasten my bra clasp! I struggle to use a knife to cut up my food. Owen has become a great chef de cuisine, cooking for me is quite the adventure…. chopping things with a sharp knife frankly dangerous when you have a left hand that doesn’t cooperate. Woe betide random dogs that may be lurking in the kitchen! I’ve been known to virtually concuss said pooch by virtue of spastically launching a stray can of tomatoes! Everything just takes so much longer and requires so much more effort. If I was a grand procrastinator previously you can only imagine how much worse I am now. Medications mask my ability to be my old self. I feel like stroke really has aged me. There are times when I feel quite frail and feeble. I get upset from time to time. There is such a sense of loss. I recently watched the documentary: My Brain and Me, that Andrew Marr the veteran BBC journalist has made about his recovery from stroke. In it Marr talks about how it’s the small things that accumulate and make life a bit crappier than it otherwise would be. It describes in a nutshell how I feel. I am a different person than I was a year ago, stroke has changed me, and as a changed person living with the consequences of stroke share and reinterpret stroke in the context of my life experiences, personality and character. As this year has progressed Ive learned that whilst others can support you, you have to become your own expert on stroke. Despite the consequences of stroke I have not given in, nor given up control of my life. Rather I have started to find a balance between acceptance and change. We all want to believe when we have a problem in our lives , there is someone or something out there that can fix it. As I read back on my posts this past year… this is very much the recurring theme in my story. Next post: Pain, is it all in your head?